The new Quest apartments come in studio all the way up to three bedrooms in size. 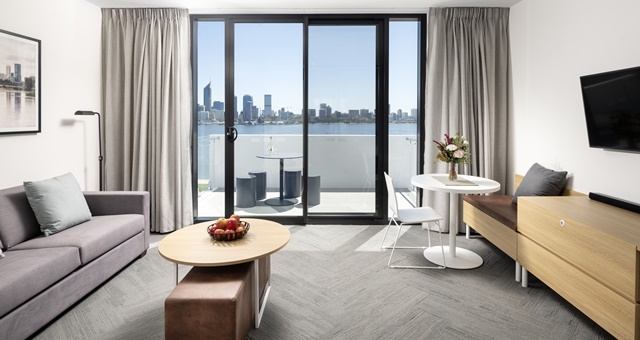 Only a week after opening its largest Australian property in Melbourne, Quest Apartment Hotels has crossed the country to take the wraps off yet another newbuild – the Quest South Perth Foreshore. Now numbering 11 in Perth and 15 in Western Australia, Quest’s latest location has been developed by Silverleaf and is part of a larger development on Mends Street. Near to the new apartment hotel is the Millstream Retail Arcade – all part of the $7.5 million Mends Street Connect Precinct – a burgeoning business and lifestyle centre next to the Swan River. The area is seeing an influx of new cafes and retailers opening up, while a 24-hour supermarket is also nearby. The 90-unit location comprises studio, one, two and three-bedroom configurations, with each residence offering views of the Perth skyline. Located around six minutes’ drive from the city or 10 minutes by ferry, the hotel is also located near the Perth Zoo and the Bentley Technology Park. In addition to Quest hallmarks such as individual kitchen and laundry facilities inside apartments, guests can access an onsite gym, outdoor BBQ area, business lounge and meeting spaces fitted with the latest AV technology. Most apartments in the new Quest offer views over the Swan River. 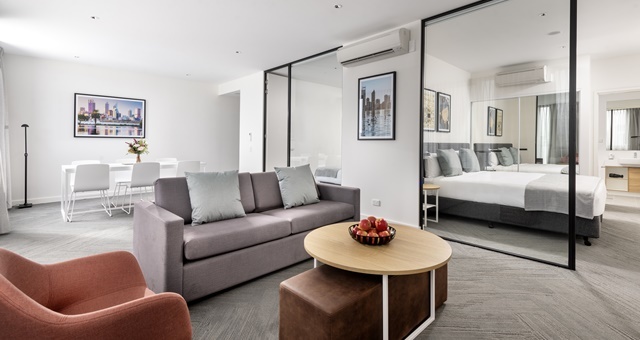 Quest Apartment Hotels Chief Commercial Officer, Craig Ryan, said Quest was committed to meeting the needs of its corporate and leisure clients at its new location.